Search for a page with very little content, eg. 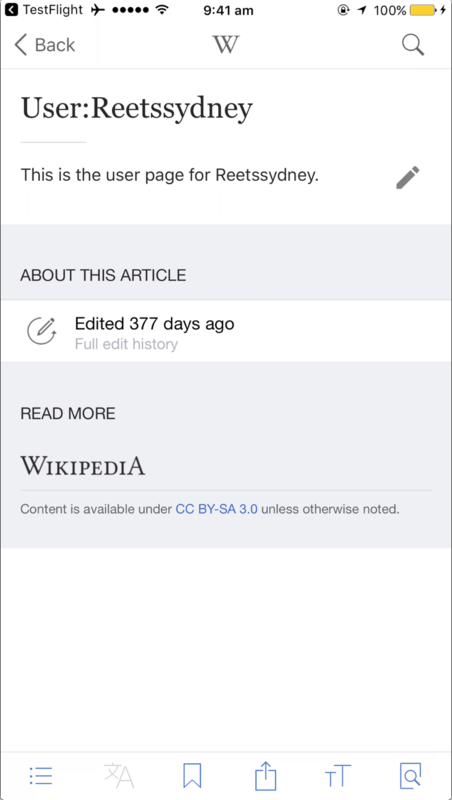 "User:Reetssydney"
JMinor added a project: iOS-app-v5.6.1-Goat-On-A-Plane. JMinor moved this task from Needs Engineering Sync to Ready for Development on the iOS-app-v5.6.1-Goat-On-A-Plane board. I take 'sticky' to mean the footer word mark would stick to the bottom of the page, which I'm guessing you didn't intend. Presently we dynamically adjust the space beneath the work mark to allow you to scroll the last section to the top of the screen. This is because the TOC's current selection triggers based on which section is scrolled near the top of the screen. Without this there are weird TOC issues, which we fixed in a previous release. Making the white at the bottom gray is the option I would recommend for now, if that's ok.
@Mhurd and @RHo, making the gray extend to the bottom sounds like the best solution for now. Thanks! Mhurd moved this task from Blocked or Waiting to Doing on the iOS-app-v5.6.1-Goat-On-A-Plane board.